Bolstered by a $1 million grant from retail giant Wal-Mart, conservation groups plan to protect almost 900,000 acres of wilderness, including land stretching along 125 miles of the Grand Canyon's North Rim. Conservationists said the $4.5 million purchase of two private ranches, totaling about 1,000 acres, also will help protect more than 850,000 acres that are attached to the land through grazing permits from the North Rim to the Utah line. The acquisition connects three national monuments, two national recreation areas and eight wilderness areas, shielding them from further development and restoring overgrazed lands to nurture endangered species in the region. 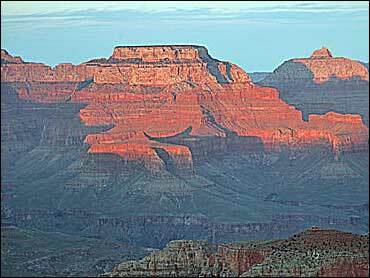 "That's the beauty of this deal," said Richard Mayol, a spokesman for the Flagstaff-based Grand Canyon Trust, which will manage the land. Mayol said the purchase was long desired by conservationists but was becoming increasingly crucial as development moved closer from St. George, Utah, and the Arizona Strip, the northernmost part of the state cut off by the Grand Canyon. The trust placed a deposit on the land, giving it until July to officially purchase. "We felt if didn't move on this now, the land could be subdivided into mini parcels or sold to developers," Mayol said. The Conservation Fund helped solidify the deal using a grant from Wal-Mart Stores Inc.'s "Acres for America," a program launched Tuesday in partnership with the National Fish and Wildlife Foundation. Wal-Mart pledged $35 million to buy land equal to all the land its stores, parking lots and distribution centers use over the next 10 years. That would conserve at least 138,000 acres in the United States as "priority" wildlife habitat. "The ultimate purpose is to create a grazing and restoration plan for the West," said Larry Selzer, president of The Conservation Fund, based in Arlington, Va. "No other company has stepped forward with that type of a bold initiative." The money will go to the National Fish and Wildlife Foundation, a private nonprofit group created by Congress in 1984 to leverage federal dollars for conservation projects. The Arizona project comprises the Kane and Two Mile ranches. They include desert areas in Marble Canyon; pinon-juniper forests surrounding the Vermillion Cliffs National Monument, where dozens of endangered California condors have been released into the wild; and spruce-fir in the higher reaches of Kaibab National Forest. The area is also home to the Kaibab squirrel and Apache trout, Mayol said. Squaw Creek in Oregon: Buying a conservation easement on a private ranch to protect 1,120 acres along a tributary of the Deschutes River to aid salmon and steelhead fish populations. Catahoula National Wildlife Refuge in Louisiana: Buying privately owned land to expand the refuge by 40 percent to 6,098 acres. Sherfield Cave/Buffalo National River in Arkansas: Adding 1,226 acres of bat habitat. Downeast Lakes region of Maine: Protecting 312,000 acres around Washington County, including 54 lakes and 1,500 miles of river and stream shoreline.